Jewellery which shows the world just who you are, jewellery you can wear on any occasion to truly personalise your look: SeiMia is the necklace collection you create just as your heart desires, with letters and symbols in rhodium plated silver. SeiMia is the necklace collection containing letters you can use to spell out your name, but that’s just the beginning. You can wear a pendant with just your initial, or you can write out a word that holds a special meaning for you, making it your motto to keep with you every day. Choose the base for your customised necklace and start creating! The SeiMia Collection offers two different types of necklace bases: the silver chain with adjustable closure, and the black fabric rope if you’re looking for something more low key. How do you make a personalised necklace from Nomination’s SeiMia Collection? Choose charms with letters, coloured gemstones, symbols and pendants and add them to your base. Your silver name necklace will shine brightly every second of the day: all letters are adorned with sparkling Zirconia, as are the charms with symbols which you can also add to your jewellery. If you’d like, you can create a necklace with coloured Zirconia in addition to your name: among this collection’s pendants you’ll find charms with pink, red, light blue, black and white Cubic Zirconia, which you can alternate between letters and symbols for a customised necklace which reflects your personality. Charms with hearts, stars, circles, four-leaf clovers, crosses, butterflies, angels, and boys and girls complete the collection, allowing you to create thousands of possible necklace combinations.In addition, there are also pendant charms with chains: singles, with Zirconia or white pearls, or triple chains with two different lengths for a necklace that rocks! Have fun creating all sorts of different combinations using the SeiMia charms. A single letter pendant can be mixed with symbol or gemstone pendants to create a truly unique and personal name necklace. Or frame your name on each side with charms with symbols, gemstones and small chains. But SeiMia is more than just a personalised name necklace! Using the letter charms you can write out a word or phrase you want to keep with you everywhere. For you, but also for someone you love. A customised necklace is the perfect gift for your best friend’s birthday, for an important milestone like a graduation, or simply to send a loving message to your mother or sister. So start making your SeiMia pendant necklace: for you or for someone special, to show the world just who you are! 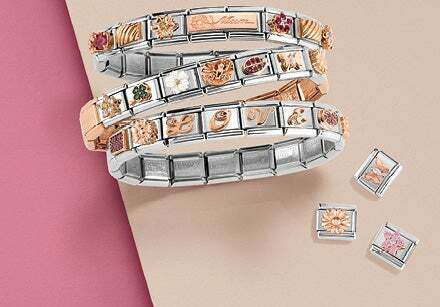 The SeiMia collection is not only about necklaces and pendants: the symbols and precious letters can also be used to create a personalised bracelet to put on every day. Choose the base: the silver bracelet can be simple or more elaborate and can accommodate one or more pendants. What pendants can you add to your made-to-measure piece of jewellery? 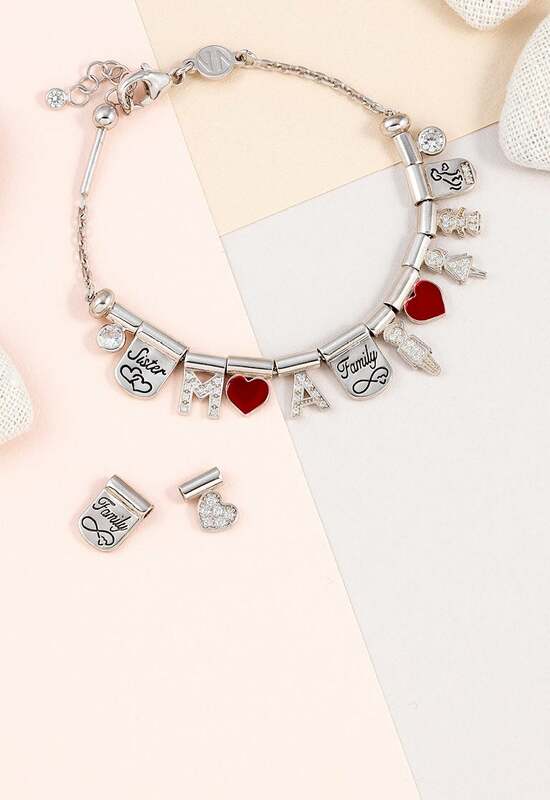 Cubic Zirconia letters, coloured hearts and stars and silver platelets decorated with symbols dedicated to family, friendship or pets. In addition, with personalised SeiMia jewellery you can choose to engrave silver platelets with a personalised message: the perfect special gift for showing a unique woman how much we love her. And why not, you can get personalised engraving for yourself: carry your motto, your name or a value in which you believe on a personalised SeiMia silver bracelet! 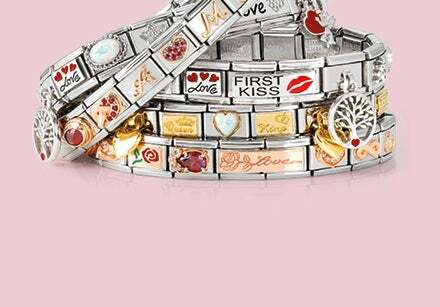 Create all the combinations you can imagine and wear the charm bracelet made just for you!